I’m hoping that as you read this the sun is shining and you’re sitting out in the garden and getting truly into the summer spirit. But knowing how fickle our weather can be, you may be sat on the sofa watching the rain on the window pane. I hope it’s the former not the latter! 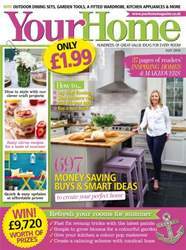 Anyway, we’re looking on the bright side in this issue and have packed it with lots of feel-good summer ideas for you and your home. On page 44 we take a look at the latest barbecues and outdoor pizza ovens to make your summer get-togethers go with a swing. While on page 100 we’ve put together some zingy recipes that make the most of summer’s refreshing citrus flavours (the citrus-marinated lamb steaks are ideal for popping on your barbie!). The seaside is a big trend on the high street this summer, so on page 20 we explain how to give your décor a classic nautical feel, and on page 54 we’ve pulled together a whole host of affordable finishing touches to give your bathroom a relaxing coastal look. We’ve even got a gorgeous sparkling fish cushion project on page 64 to complete the watery theme! If you love being in the garden at this time of year, turn to page 114 to discover this year’s hero plant, the Cosmos, it’s so easy to grow and provides oodles of flowers to cut for the house. Finally, you must try making our gorgeous garden veg-inspired table decorations on page 60, they’ll make the ideal finishing touch to your summer garden parties.